Cutlery goes through fads and fashion cycles just like anything else. Here are a few that need to fade into the sunset. Everybody has opinions. These are mine from working with knives for many years. 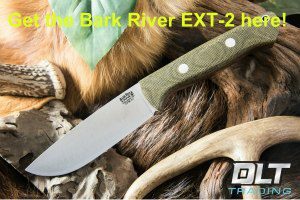 I’ve seen fads come and go, and here are five (mostly related to rigid blade knives) that seem to be going strong right now. Thick blades: As best I can tell, thick blades – say over 1/8-inch – are a recent innovation. Check out historic fighting knives in museums, and you’ll find that for the most part they are pretty thin. There’s a reason for that – most of the knives used for fighting on the frontier, or in earlier times were utility knives of some sort. 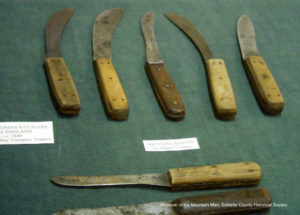 These authentic trade knives are on display at the Museum of the Mountain Man. Steel was expensive, and a settler, trapper or longhunter might only have one knife. It would be handmade to his specifications by the local blacksmith, and the knife owner would get something that worked for the most tasks. 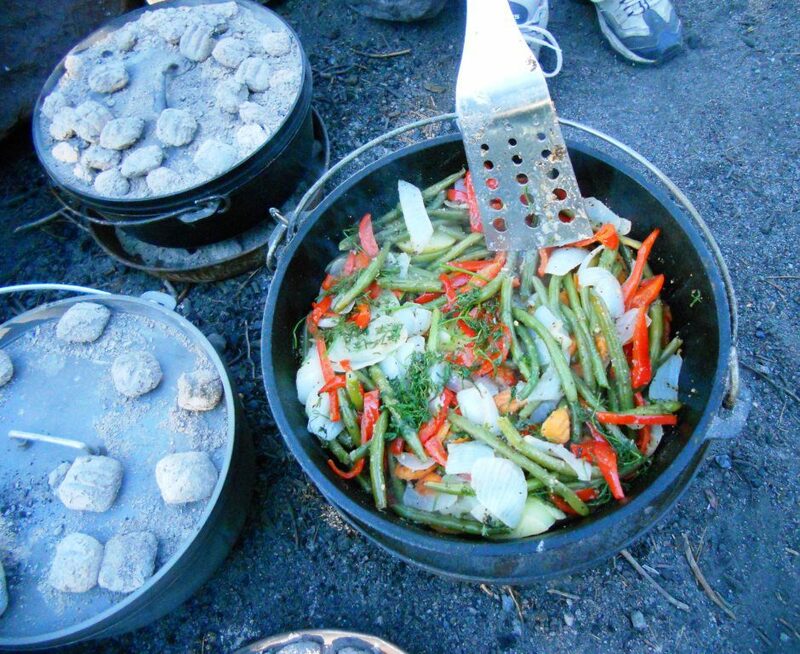 Since the knife might be called upon to butcher game, cut vegetables, whittle sticks, fight with etc. the most cost effective and useful thickness would be chosen. 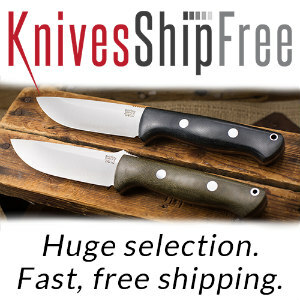 Check out the original mountain man and trade knives from the 1830s – thin was in. And the colonists in the mid-to-late 1700s – they were called “Long knives” because of the long blades they carried. The best representation of these tried-and-true designs is in your kitchen knife rack. IMO, the idea of thick blades goes back to World War II when quality steel was at a premium. In 1942, the Ka-Bar was adopted by the Marines Corps, and many other service branches. This iconic blade was thick for extra strength because good steel was scarce and needed for other things. With today’s super steels, there is no particular need for a thick blade. If you anticipate doing a lot of prying or twisting with the blade, get a crowbar. The guthook ruins the looks and uses of this Case knife. Gut hooks: A really quick way to ruin a good knife design, IMHO, is to add a guthook. I’m not sure exactly where this idea came from, but a guthook is one of the most specialized grinds imaginable. Originally, I guess, the idea was to use the hook to make a specialized cut down the belly of a downed big game animal without piercing the entrails. This guthook uses replaceable blades and costs $20. Other than that, there is no reason for that grind. One cut per big game animal is not enough reason to permanently screw up a blade. And don’t overlook this – the hook is a dangerous accessory that might pierce a hand or clothing or get hung up on a sheath. And field dress a bear or late season elk – you’ll find that the hook gets easily jammed with hair. 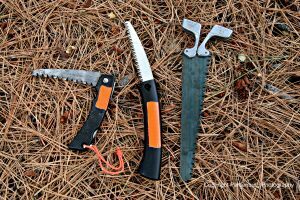 Sharpening that guthook takes skill and a specialized file you might not have along in the backcountry. If you must have a gut hook knife, get a dedicated one for about $20. 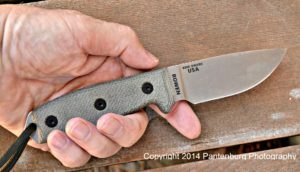 This Columbia River Knife and Tool folder would be more effective with a fine edge. Serrated edges: The best way to screw up the most useful carving part of a blade is to get one with about an inch of serrations right next to the hilt. The serrated portion might be handy if you’re cutting a lot of zipties or anticipate cutting seatbelts, like an EMT might need to do. 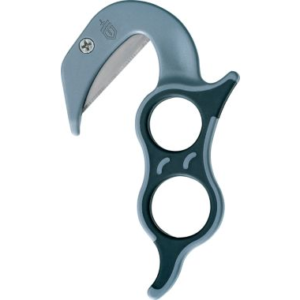 In those cases, you need a specialized first responder knife, with a blunt tip and full serrations on the blade. The only serrated knife I currently own is the bread knife in the kitchen. It works well for cutting bread, and that’s all it’s ever used for. Choils: I love historic cutlery, and I’m the type who hunkers down next to a display case to study the details. I have never seen a choil on a historic knife, and don’t see the need for one. Like serrations, the choil takes the most useful carving section of the blade out of commission. Proponents claim a choil allows the user to “choke up” on the blade to do fine carving or other tasks best suited to a smaller blade. 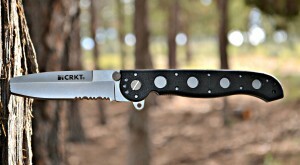 The choil on this ESEE-3 blade is not necessary or useful. So let’s think about this: I’m going to “choke up” on this sharp blade to do fine carving or something. I’m supposed to put my trigger finger next to a razor-sharp edge, negating the protective hilt and handle. 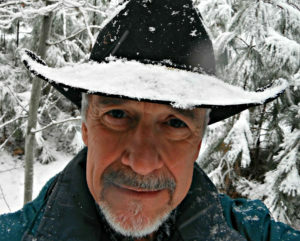 In decades of small game, deer and elk hunting, I’ve never choked up on a blade to gut or skin an animal. I’ve also never needed a choil for wood carving or cleaning fish. Or anything. I got an ESEE-3 a couple years ago to see if I had maybe been missing out, and to try using a choil before condemning them outright. Didn’t work. 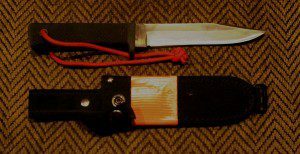 I wish the ESEE-3 didn’t have the choil at all. A better choice than a choil would be to get a knife suited for the task, with a well-designed handle. Saw blade spines: These never work. For a saw to cut, the tips of the teeth have to be offset from each other, and protruding from the side of the blade surface. Otherwise, teeth will clog up with saw or bone dust and have to be cleaned about every couple strokes. This also means the teeth will cut into the sheath every time the blade is pulled out or put back in. Any of these lightweight saws are a better choice than a saw blade spine. In addition, a three-to-four inch saw surface will have a stroke of about and inch or two. It will wear out the user and be really ineffective. Both saw teeth and a gut hook make the spine of the knife dangerous, and keep you from using it to process tinder or scrape ferro rods. Again, rather than screw up your knife, get a folding saw and take that along. And a knife has to have a black blade to look badass at the militia meeting, right? This Cold Steel SRK has served me well for more than 25 years. It started out with a black blade. The first thing I did to my Cold Steel SRK some 25 years ago was to take that black paint off the blade. While the coating may offer some protection from rust, proper maintenance offers complete protection. The coating inevitably wears off, it affects the slicing ability and looks awful. IMHO, a more likely scenario is you will drop the knife and have trouble locating it. If you’re in mud or the dark, this worsens the situation. If you’re considering investing in a knife, think first about what you might be using it for. 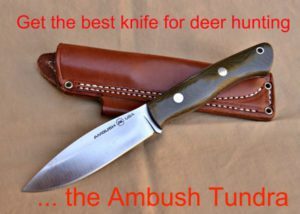 Consider the handle, and what it’s made of; the quality of the steel, the grind, blade length and the point configuration. Don’t forget to consider spine configurations. It should have a sturdy sheath. 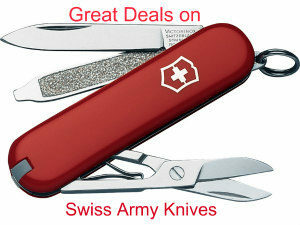 Once you’ve considered these aspects, you are ready to choose a piece of cutlery. 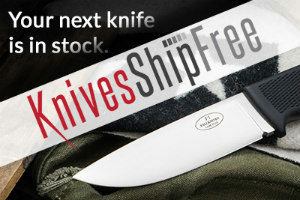 Then you can decide how fashionable your knife needs to be! 100% agree on all counts! I LIKE YOUR THOUGHTS ON KNIFE FADS THAT GOTTA GO. MONSTER BLADS, GUT HOOKS, ALL THE OTHERS. 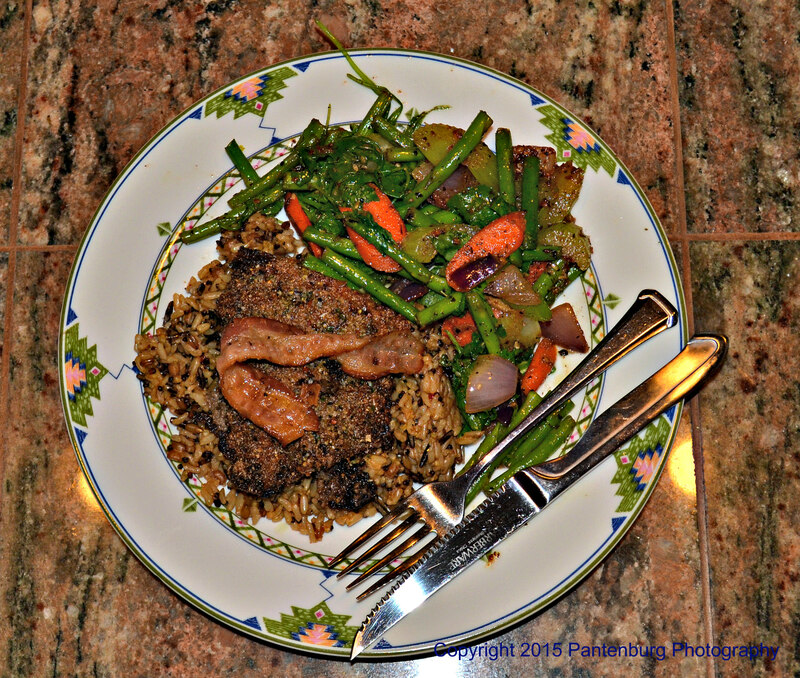 I USE REPURPOSED CARBON STEEL BLADE KNIVES AND HAVE FOR YEARS. THEY REQUIRE EXTRA CARE,BUT THEN SO DOES MUCH OFYOUR GEAR. I LIKE THE WAY YOU THINK. GOOD GOING !! 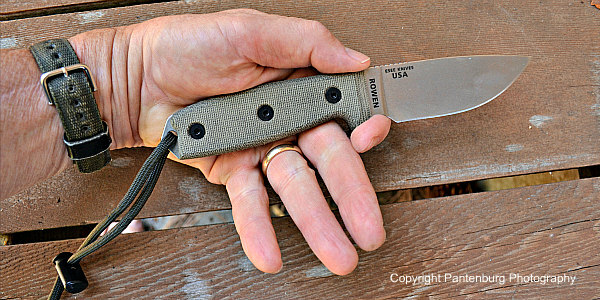 (5 KNIFE FADS THAT GOTTA GO). 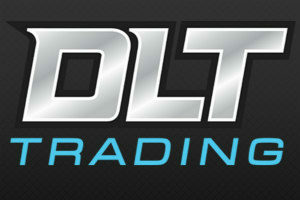 GUT HOOKS, SERRATED BLADS, HUGE BOWIE KNIFE BLADES, ETC. I USE REPURPOSED CARBON STEEL KNIVES AND HAVE FOR YEARS. LIKE ALL OTHER HUNTING GEAR YOUR KNIVES NEED ATTENTION.BALLISTOL CLEANS AND PROTECTS KNIVES AND OTHER GEAR. KEEP ON. I LIKE YOUR TRAIN OF THOUGHT.